Make sure to reserve a portion of the peaches as you puree the mixture so the pops will be packed with icy cold, chunky bits of fruit. For a grown-up twist, try adding 1 to 2 teaspoons finely chopped fresh mint, lemon verbena or basil. Coarsely chop peaches in a food processor. Transfer 1 cup of the chunky peaches to a medium bowl. Add lemon juice, orange juice and sugar to taste (depending on the sweetness of the peaches) to the food processor. Puree until smooth. Add to the bowl with the chunky peaches and stir in vanilla. Divide the mixture among twelve 2-ounce or eight 3-ounce freezer-pop molds (or small paper cups). Freeze until beginning to set, about 1 hour. 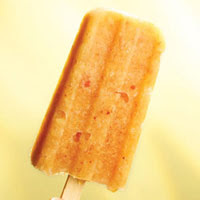 Insert frozen-treat sticks and freeze until completely firm, about 1 hour more. Calories 33, Carbohydrate 9 g, Fiber 1 g, Potassium 90 mg. Exchanges: Fruit 0.5. This entry was posted on 1:33 AM and is filed under Gluten Free . You can follow any responses to this entry through the RSS 2.0 feed. You can leave a response, or trackback from your own site.